1950s Vogue Ginny Doll 7 1/2-8"
Vogue was founded by Jennie H. Graves and grew from modest beginnings, to be the largest doll only manufacturer in the world. 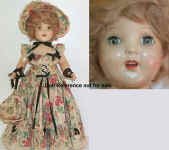 Vogue is best known for their Ginny doll, named after Mrs. Graves daughter; Virginia Graves and the companion doll line. Ginny dolls had beautiful clothing wardrobes and lots of accessories. 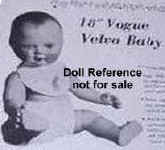 The second most popular Vogue doll was the Vogue Baby Dear dolls and all their variations. 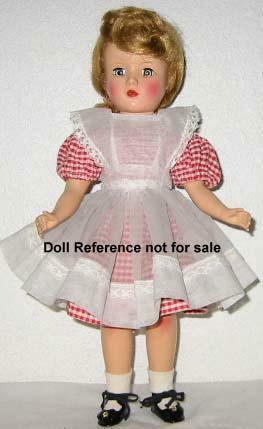 In 1958 Arranbee doll company became a division of Vogue who continued to use the R & B doll markings until 1961. 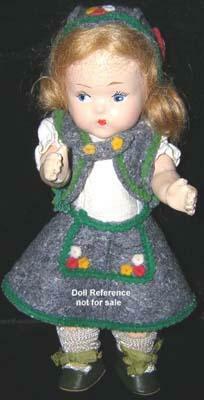 Vogue dolls can be made of bisque, rubber, composition, celluloid, hard plastic, vinyl and plush stuffed animals. See below for the many Vogue dolls identified. 1925-1930s Vogue Just Me doll and family, 8-11" tall, bisque head on jointed composition body, side glancing sleep eyes, mohair wig, small bow closed mouth, redressed by Vogue. Just Me was made by Armand Marseille, doll marked: Registered, Germany, A 310 7 0 1 or similar. Others dolls were Peggy Jean doll 8", Suzanne doll 11" (big sister to the Just Me doll) and Nancy Lee doll, size unknown. 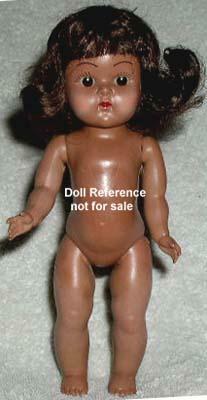 Doll shown is doll mold 310 by Armand Marseille. Clothing shown on doll is not by Vogue. 1925-30s Just Me doll mold 310, 11"
1937-1940 Vogue Dora Lee doll, 11" tall, all composition fully jointed with a slim body and legs, mohair wig (some may have molded hair beneath the wig), sleep eyes, with real upper lashes and painted lower lashes, smokey eye shadow, doll is unmarked. Came in various outfits, one was a nurse, her shoes have Dora Lee stamped in ink on the bottom , which is the only thing that makes her a Dora Lee. 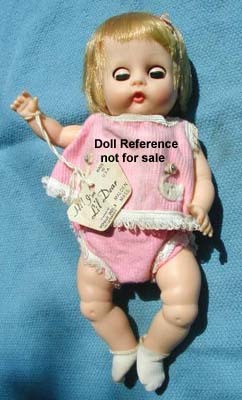 Doll was most likely purchased from Arranbee and is their 11" Debu'teen doll, then redressed and sold by Vogue. 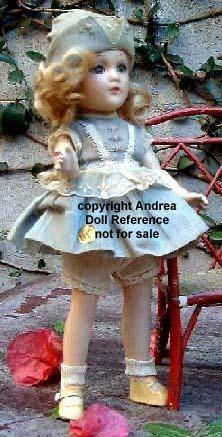 Knickerbocker's Blondie doll is also a Arranbee sleep eye Debu'teen doll redressed. Dora Lee is very hard to find, which explains why all three photos shown here, are courtesy of Andrea. 1937-1940 Dora Lee doll, 11"
1937-1949 Vogue Toddles doll or Toodles doll 8" tall, first ones were made by Arranbee, and redressed by Vogue, all composition, chubby body, PE painted eyes and facial features, marked R & B Doll Co on back. Later marks are: on head Vogue on back Doll Co. or Vogue or a combination of the two and sometimes no marking on head or back. 1945-1949 dolls are marked on head or back Vogue. 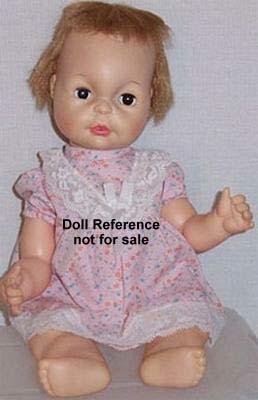 This is the precursor to the well known and loved Ginny doll. On left is Toddles wearing a Tyrolean outfit. 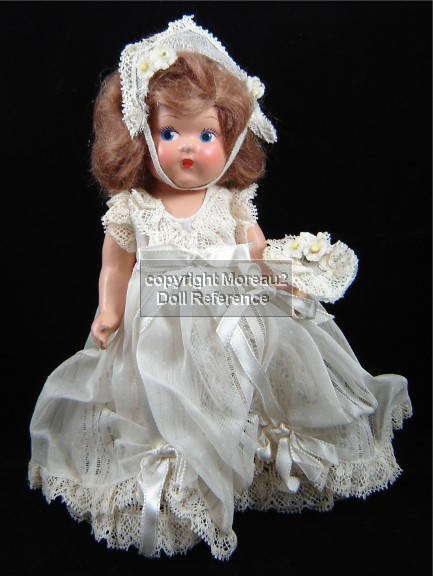 1940 Toddles Bride doll, 8"
1938-1940 Vogue Sportswoman doll, 18" tall, all composition with jointed body, wigged, sleep eyes usually brown, real upper lashes, painted lower lashes, closed mouth (uses the Arranbee Debu'teen 18" doll), came dressed in various sports outfits; Golfer, Ice Skater, Skier and Tennis Player. 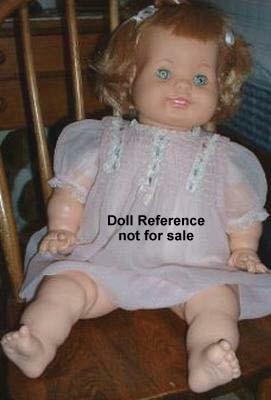 Dolls are unmarked. 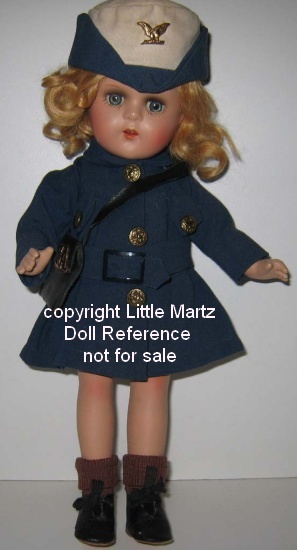 1940s Vogue W.A.V.E doll, Vogue W.A.A.C doll, 13" tall, all jointed composition with mohair wigs, sleep eyes, open mouth with two upper teeth, came dressed in the appropriate uniform with cap and small leather shoulder purse. 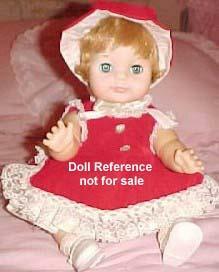 Dolls are unmarked, bottom of shoe sole maybe stamped Vogue. 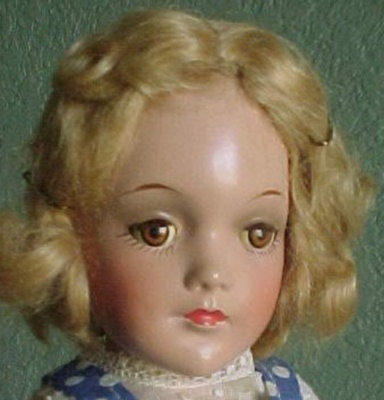 1940s Vogue Cynthia doll, 13" or 18" tall, (she looks to us, to be a Shirley Temple look-alike), all composition, jointed body, sleep eyes with lashes, open or closed mouth, blonde wig. 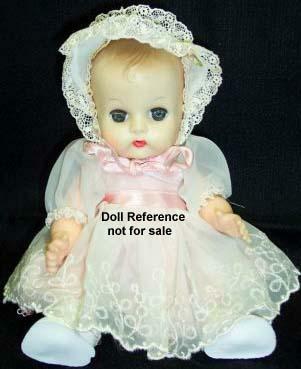 Doll is unmarked or marked with an X in a circle and looks similar to the makeup dolls. Also sold in a set called: My Sister & Me dolls. Toddles doll 8" and Linda doll 20". 1943-1944 Vogue Makeup dolls; Mary Jane doll 13" tall, Betty Jane doll 16" tall, all composition, jointed body, mohair wig, sleep eyes, open or closed mouth, came with a makeup bag tied to their wrist, dolls are marked with a number according to size 13 USA, 16 USA. Dolls were purchased from Ideal and re-dressed by Vogue, so you will need Vogue tagged clothing to make certain your dolls identity. 1943-1944 Vogue Jennie Makeup doll, 19 1/2" tall, all composition, blue sleep eyes, real eye lashes, painted lower lashes, slight open smiling mouth with teeth, wigged, fully jointed and shown in original clothing, doll is unmarked. Photo courtesy of Flozdolz, pristine & all original. 1943-1944 Jennie doll, 19 1/2"
1948-1951 Vogue Velva Baby doll, 15, 18 or 21" tall, nine month old baby doll sculpted by Bernard Lipfert, composition head with molded and painted hair, latex "magic skin" rubber stuffed body (that has probably deteriorated and may explain why few if any are found today), doll came as a drink wet type with hard plastic head in 1950-1951, head marked: Vogue Doll, body unmarked. 1948-1952 Vogue Crib Crowd Baby doll, 8" tall, baby type, hard plastic with curved baby type legs, mohair wigs nicknamed "poodle" cut style, PE painted eyes, (1950-1952 some dolls have sleep eyes, a caracul sheepskin wig, straight legs and were part of the Kindergarten series). Head marked: Vogue, back marked: Vogue Doll. 1950 Crib Crowd Baby doll, 8"
1948-1950 Vogue Ginny doll is 7 1/2-8" tall, (named after Jennie Graves daughter Virginia ie. Ginny), all hard plastic, toddler type jointed body, wig, molded hair under the wig, PE painted side glancing eyes, closed mouth, marked on head: Vogue, and on back: Vogue Doll, clothing is also marked Vogue Doll. 1950-1953 Vogue Ginny doll, 7 1/2-8" tall, hard plastic, jointed body, sleep eyes, PL painted lashes, mohair wig with gauze strip, marked on head: Vogue, and on back: Vogue Doll, clothing is also marked Vogue Doll. 1953 Vogue Ginny doll, 7 1/2-8" tall, hard plastic, black doll, sleep eyes, PL painted lashes, black mohair wig, jointed at neck, arms and hips, straight leg non-walker. 1954 Vogue Ginny doll, 7 1/2-8" tall, hard plastic, jointed body, SLW straight leg walker, wig, sleep eyes, PL painted lashes, (PLW abbreviation of Painted Lash Walker), closed mouth, marked on body: Ginny, Vogue Dolls Inc, Pat. Pend., Made in USA, shown in the Queen Elizabeth Coronation outfit. 1955-1956 Vogue Ginny doll, 7 1/2-8" tall, hard plastic, jointed body, SLW straight leg walker, wig, sleep eyes, molded lashes, (MLW abbreviation of Molded Lash Walker), closed mouth, marked on head: Ginny Vogue Dolls, Inc., marked on body: Vogue Dolls Inc, Pat 2687594, Made in USA. 1957-1962 Vogue Ginny doll, 7 1/2-8" tall, hard plastic, jointed body, BKW bent knee walker, wig, sleep eyes, molded eyelashes, closed mouth, marked on head Vogue, on body: Vogue Dolls Inc, Pat 2687594, Made in USA. 1960 Vogue Ginny doll, 36" tall, walker type, carried an Ginny 8" doll just like her, unmarked. See below for her photo and description. 1963-1965 Vogue Ginny doll, 7 1/2-8" tall, vinyl head, plastic body, jointed body, rooted hair, sleep eyes, closed mouth, marked on head: Ginny, on body: Vogue Dolls Inc, Pat 2687594, Made in USA. 1965-1971 Vogue Ginny doll, 7 1/2-8" tall, all vinyl, rooted hair, sleep eyes with molded eyelashes, jointed body at the neck, arms and hips, with straight legs a non-walker. 1972-1977 Vogue Ginny doll, 7 1/2-8" tall, all vinyl, jointed body, rooted hair, sleep eyes, closed mouth, marked on head: GINNY, on body: Vogue Dolls © 1972, Made in Hong Kong. 1952 Ginny Tina Sue doll, 7 1/2-8"
1953 Ginny doll, 7 1/2-8"
1953 Ginny doll black, 7 1/2-8"
Coronation Queen doll, 7 1/2-8"
1949-1950 Vogue Young 49ers doll, 8" or 14" tall, all hard plastic jointed body, sleep eyes, wigged, the 14" size is marked on head: 14 and on body; Made in USA. These dolls were made by Arranbee, Ideal, Roberta possibly and redressed by Vogue, if in original clothing it will have the Vogue tag. 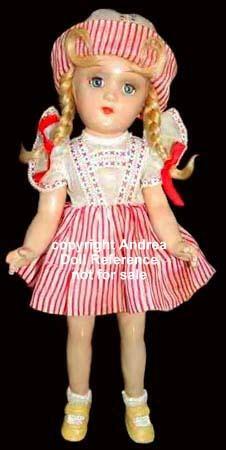 Other doll names are: Daughter doll and Baby doll (both 8" tall), Mother doll, Patty doll, Peggy doll, Penny doll, Polly doll, Bridesmaid doll and Bride doll (all 14" tall). The Mother, Daughter and Baby dolls were a set. 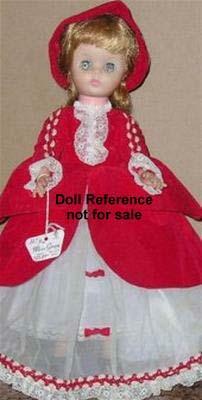 Doll shown has correct markings, but original clothing is untagged, so we can't be sure this is the "Vogue" doll, but all the examples show this doll dressed accordingly. If you think she's a Roberta doll, we wouldn't argue with you, check the Hard Plastic Doll Marks page for other mfg's. that used this marking, when trying to make an identification. 1949-1950 Young 49ers doll, 14"
1949 Vogue Wooley Baa Baa Lamb, 12 or 14" tall, stuffed rubber lamb, white or black, in the 1950s the lamb came in various colors. 1952 Vogue Pee Wee Lamb, 9" tall, various colors, stuffed lamb. 1951-1952 Vogue Honey Bunny, 8" tall, Scottie dog, 9" tall, Snoozie Kitty, 12" tall and 1952 Teddy Bear, 8" tall. 1951 Vogue Scottie dog, 9"
1955-1969 Vogue Ginnette doll, (Ginny dolls baby sister) 8' tall, all vinyl, drink wet doll, and one squeaker model (shown in photo), molded brown hair, jointed body, open mouth, blue painted eyes 1955-1956, sleep eyes with tears only in 1957 or sleep eyes with molded lashes 1957-1969, some of her outfits match sister Ginny's, marked on back: Vogue Dolls Inc., on head: unmarked, 6, 13 or 19 and Vogue Dolls © 1967. 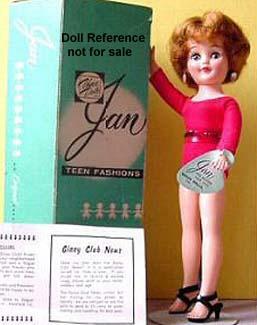 1962-1963 Vogue Ginnette doll, 8" tall, similar to above doll, now came with rooted hair. 1964-1965 Vogue Ginnette doll, 8" tall, black doll, did not drink or wet, sculpted hair or rooted saran hair. 1957 Vogue Jill doll, (big sister to the Ginny doll) 10 1/2" tall, hard plastic teenage jointed body, jointed bent knee walker, high heel feet, sleep eyes, ponytail or short angel cut hair style glued on wig; brunette, blonde or auburn, pierced ears, closed mouth, doll marked on back: Jill, Vogue Dolls, Made in U.S.A., © 1957. Head is unmarked. 1958-1960 Vogue Jill doll, 10 1/2" tall, about the same as above doll, may have a pinker skin tone, now marked on back: Jill, Vogue Dolls, Made in U.S.A., © 1957. Head is unmarked. 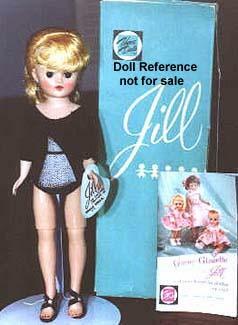 1961 Jill was discontinued, but brought back the next year. 1962-1963 Vogue Jill doll, 10 1/2" tall, has a rooted bubble cut hair style with bangs; auburn, brunette, or platinum, all vinyl with sleep eyes & high heel feet, head now marked: Vogue, body unmarked. 1963 Vogue Sweetheart Jill doll, 10 1/2" tall, all vinyl, has rooted beehive style hair, head marked: Vogue, body unmarked. 1965 Vogue Jill doll, 11" tall, all vinyl, 6 historic costume styles, various rooted hairstyles, head is marked 6 or 19, body marked: Vogue Dolls, Inc.
1957 Jill doll, 10 1/2"
1958-1960 Vogue Jan doll, (friend to the Jill doll) 10 1/2" tall, vinyl, jointed body, straight legged, high heel feet, twist and turn waist, rooted hair ponytail or bubble cut various colors, sleep eyes and molded lashes, closed mouth, pierced ears, doll head marked VOGUE. 1963-1964 Vogue Lovable Jan doll and Sweetheart Jan doll, 12" tall, much longer neck, bubble cut rooted hair, now doll head marked Vogue. 1958 Jan doll, 10 1/2"
1958-1960 Vogue Jeff doll, 11" tall, (Ginny & Jill's brother and Jan's boyfriend), all vinyl, molded hair, jointed body, blue sleep eyes and molded lashes, doll marked VOGUE DOLLS on back. Jeff is looking good in his Senior Prom, white Tuxedo jacket, black pants and shoes. 1958 Vogue Jimmy doll, 8" tall, (Ginny's baby brother), all vinyl, jointed, open mouth, painted eyes, head unmarked, back marked Vogue Dolls Inc..
1959-1962 Vogue Ginny Baby doll, 22" tall, vinyl jointed body, sleep eyes, rooted or molded hair, drink wet type with open mouth, marked: GINNY BABY, 10, VOGUE DOLL INC. with some variation. 1959 Baby Ginny doll, 22"
1959-1961 Vogue Brikette doll, 16 or 22" tall, twist and turn waist, pointed eyebrows, green sleep eyes, usually with orange rooted hair, (also came in the platinum and the rare brunette), freckles, doll marked on head: VOGUE INC., 19©60. 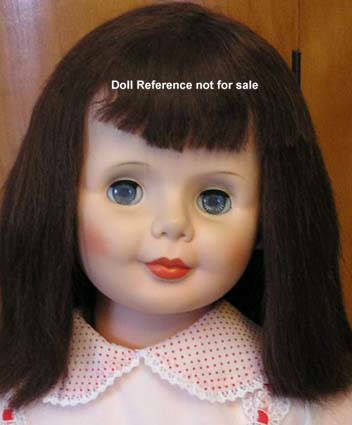 If your doll does not have freckles or pointed eyebrows, isn't marked Vogue or Lesney and IS unmarked, see Jolly Toys Jinx doll as a possibility. 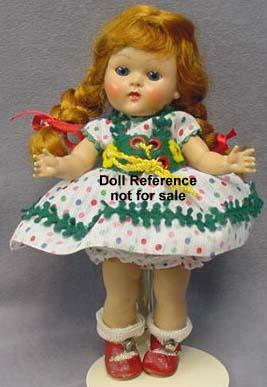 1979-1980 Lesney Brikette doll, 18" size, dolls were reissued and are marked Lesney on head. 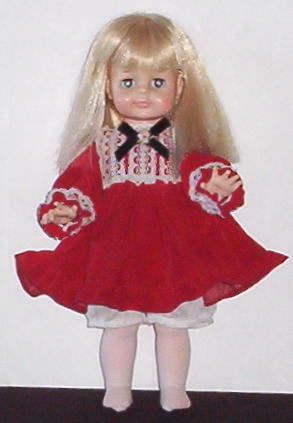 Shown is the Lesney doll in a reproduction outfit, similar to what the earlier dolls wore. 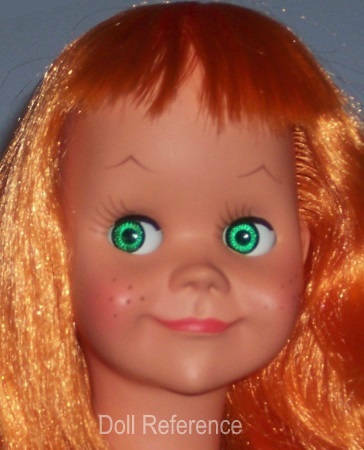 1979 Lesney Brikette doll, 18"
1959-1960 Vogue Li'l Imp doll, 11" tall, (sister to Brikette), vinyl head, bent knee walker type, green sleep eyes, orange rooted shoulder length straight hair, freckles, doll is marked on head: R and B 44 on back: R & B Doll Co (for Arranbee who Vogue bought in 1958). 1959 Li'l Imp doll, 11"
1960 Wee Imp doll, 8"
1960-1964 Vogue Baby Dear doll, 18" tall, baby type doll, cloth body, molded vinyl head with topknot on first year dolls, later ones are all rooted hair, painted blue eyes, closed mouth, marked on back: VOGUE DOLLS INC. on left leg: 1960 E. Wilkin. 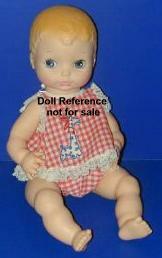 Photo shown is in original clothing, and with rooted hair, not the first year doll with topknot, but this one is appropriately marked, wearing her rosebud night shirt and diaper. There are many unknown look a like dolls of the popular Vogue Baby Dear doll most are unmarked, one doll was made by Jolly Toy Corporation, another was made by Sayco marked Pat..
1960 Baby Dear doll, 18"
1960 Vogue Ginny doll, 36" tall, Patti Playpal type doll, all hard plastic, sleep eyes, rooted hair, has a lighter weight body than the Ideal dolls, carried a Ginny 8" doll dressed just like her, doll is unmarked as is the clothing, used the Arranbee - My Angel walking doll mold and manufactured by Model Plastics, head mold sculpted by Deet D'Andrade, came in a couple of different outfits. 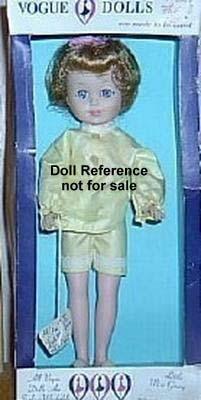 Doll is rare and hard to find and recognize as she is unmarked and only sold one year in 1960. 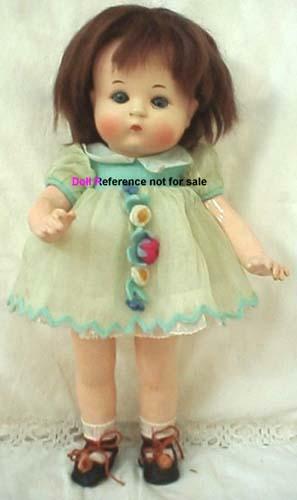 1961, 1965, 1969-1973 Vogue Dream Baby doll, 16" tall, all vinyl, molded hair, sleep eyes, jointed body. 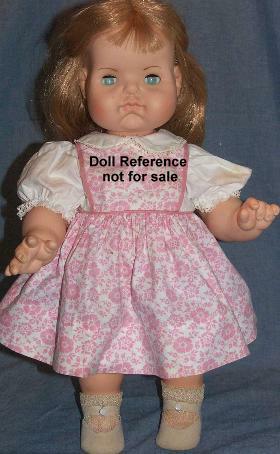 1965 Vogue Dream Baby doll came with a cloth stuffed body now in 12", molded hair, sleep eyes, neck marking is: Vogue Doll © 1964. 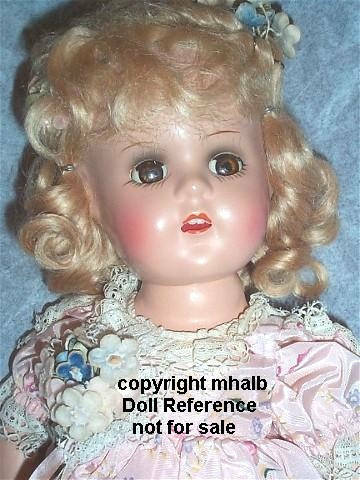 1980 doll is renamed Hillary doll, 12", has a pale bisque like appearance to the vinyl skin, molded hair, sleep eyes, long real eyelashes, closed mouth, pink cloth stuffed body, wore a cream christening gown, bonnet, marking is: Vogue Doll © 1964. 1961 Dream Baby doll 16"
1961-1963 Vogue Littlest Angel doll or Saucy Littlest Angel doll, 10 1/2" tall, (cousin to the Ginny doll) vinyl head, hard plastic body, BKW bent knee walker, sleep eyes, short rooted hair, marked on head R & B (Vogue bought Arranbee in 1957). 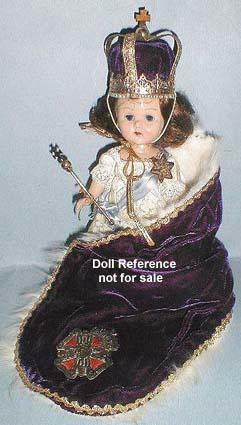 1964-1966 Vogue Littlest Angel doll was not produced. 1967-1974 Vogue Littlest Angel doll, 11or 15" tall, all vinyl, jointed neck, arms and legs, rooted short hair, new face mold with a little older looking face with puffier chipmunk cheeks, also came as a black doll, marking unknown (but no longer uses the R & B mark.). 1972 note Vogue is now owned by Tonka. 1975 Vogue Littlest Angel doll, 11 or 15" tall, about the same as previous doll all vinyl, some came with longer rooted hair, now marked on head: Vogue Doll ©1964 or ©1965. 1976 Vogue Littest Angel doll, unknown if produced. 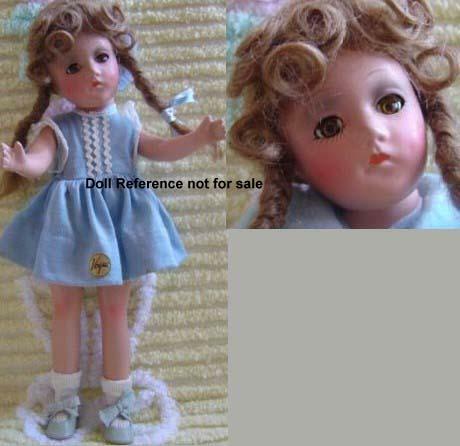 1977-1980 Vogue Littlest Angel doll, only the 15" tall size was continued, now produced by Lesney or Playmates, doll marking unknown. 1961 Littlest Angel doll, 10 1/2"
1975 Littlest Angel doll, 11-15"
1962-1963 Vogue Baby Dear One doll, 25" tall, one year old baby version of the Baby Dear doll, vinyl head and limbs, straight blonde rooted hair, foam filled cotton body, open mouth with two teeth, sleep eyes and lashes, the fingers are realistically molded separately with the index finger pointing upward. 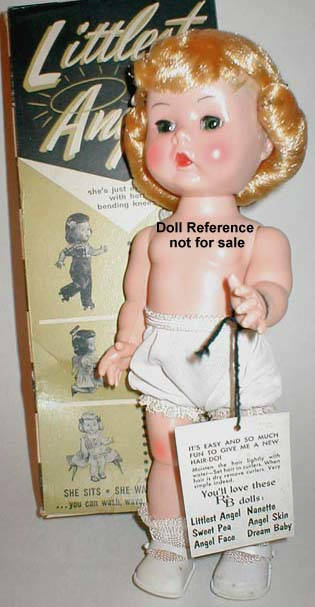 This doll has a twin brother called: Bobby Dear One doll (1963) and is the same doll with shorter hair and dressed appropriately for a boy. 1962 Baby Dear One doll, 25"
1962-1964 Vogue Miss Ginny doll, 16" tall, vinyl head that tilts, two piece plastic body, twist and turn waist with flat feet, doll usually marked: Vogue Doll 1970. 1965-1975 Vogue Miss Ginny doll was 15" tall. 1975-1980 Vogue Miss Ginny doll is marked on head Vogue Doll © 1974. 1975 Miss Ginny doll, 15"
1963-1968 Vogue Li`l Dear doll, 8" tall, vinyl head and limbs, stuffed cloth body, blue sleep eyes, molded or rooted hair, open mouth, also had a twin Li`l Dear Brother doll. 1963-1968 Li`l Dear doll, 8"
1963 Vogue Too Dear doll, 23" tall, two year old Baby Dear with a toddler body. 1963-1965 Vogue Too Dear doll, was 17" tall, head marked: © 1963-65 E. Wilkin Vogue Dolls. 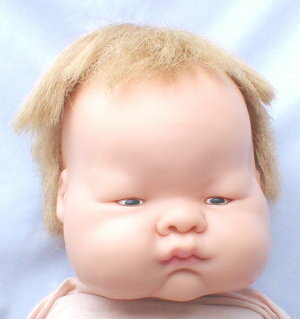 Has chipmunk cheeks, sleep eyes, closed mouth, rooted blonde hair, jointed body with chubby legs. 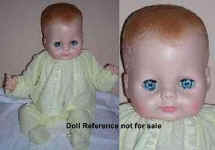 1964-1965 Vogue Too Dear Bobby doll, twin Brother, 17" tall. 1963 Too Dear doll, 23"
1964-1965 Vogue Lil Lovable Imp doll, 11" tall, all vinyl, rooted auburn, blonde or brunette hair, sleep eyes, also came in a black version doll marked on head: © Vogue Doll 1964. Separate outfits were also available. Doll shown has been redressed. 1964-1965 Lil Lovable Imp doll, 11"
1964-1965 Vogue Posy Pixie doll or Posey Baby doll, 17" tall, vinyl head and hands, foam body, large sleep black eyes, smiling closed mouth, doll usually marked 1964 Vogue 1971. 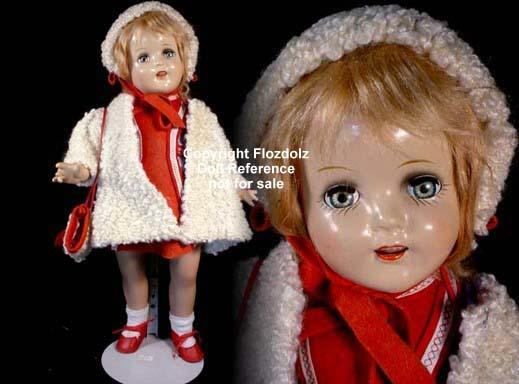 1965 Posy Pixie doll, 17"
1965, 1967-1980 Vogue Baby Dear One doll (redesigned) 25" tall, vinyl head and limbs, foam stuffed cotton body, now has a closed mouth, sleep eyes, sculptured molded or rooted hair and in 1972 a Mama crier was added. Head is marked: Vogue Dolls © 1965. 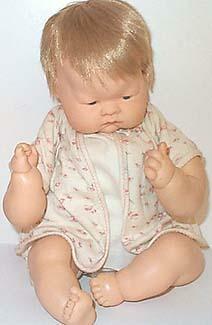 In 1976 Baby Dear One doll came with platinum hair. 1965 Baby Dear One doll, 25"
1965-1971 Vogue Little Miss Ginny doll, 12" tall, one piece hard plastic body and legs, pre teen style. 1970 Little Miss Ginny doll, 12"
1965-1968 Vogue Angel Baby doll, 14 or 25" tall, all vinyl, bent limbs, sleep eyes with lashes, strawberry short rooted hair, closed smiling mouth, doll usually marked Vogue Doll 1965. 1965 Angel Baby doll, 14"
1965 Vogue Love Me Linda doll, 16" tall, child doll all vinyl jointed body, long rooted hair, large painted eyes (was based on Lonely Lisa by the Royal Doll Co.), came with a portrait, also sold as "Pretty as a Picture" in Sears Roebuck and Montgomery Ward catalogs, came wearing a 86160 blue eyelet dress, 86171 red print dress (as shown) or 86172 blue velvet suit, marked: VOGUE DOLLS © 1965. 1965 Love Me Linda doll 16"
1966-1968 Vogue Star Bright doll, 16 & 19" tall, child doll, vinyl head and limbs, side glancing black eyes with stars, rooted blonde hair, closed mouth, marked: VOGUE DOLLS ©1966. 1966-1967 uses the same body as 1969 Littlest Angel 15" tall. 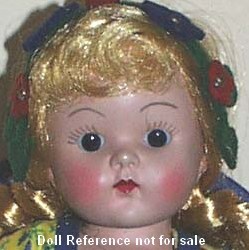 1966 Vogue Star Bright Baby doll, 18" tall, had cloth body and the Star Bright vinyl head, same marking. 1966 Star Bright Baby doll, 18"
1967 Vogue Dearest One doll, 18" tall, all vinyl baby type, drink wet type, sleep eyes, rooted hair, doll marked Vogue Doll, Inc. 1967. 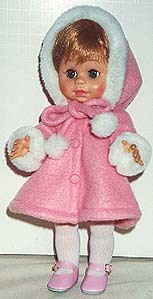 1967 Dearest One doll, 18"
1975-1976 Vogue Wash A Bye Baby doll, 12 or 16" tall, all vinyl, painted eyes, molded hair and jointed body, came in a black version too. Made by Tonka which now owned Vogue. 1975 Wash A Bye Baby doll, 12"
1962 Vogue Baby Dear Musical doll, 12" or 18" tall, has Swiss musical mechanism inside doll, plays "Rock-A-Bye Baby". 1963 Vogue Moving Musical Baby Dear doll, 12 or 18" tall, same doll as above, now wiggles too. In 1972 Vogue was sold to Tonka Toy Company. 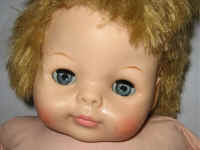 1977 Lesney took over the Vogue Ginny name, Playmates took over some of the other Vogue dolls. 1984 Meritus Industries, Inc. bought Vogue. 1986-1995 R. Dakin & Company bought rights and doll molds of Vogue. 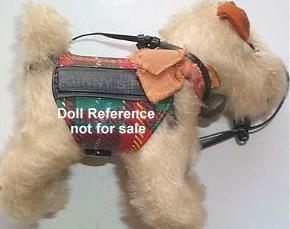 The Vogue Doll, Inc. company continues to produce modern and collector dolls today.